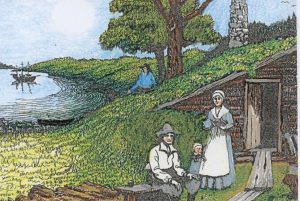 The story of Quakers in Pembrokeshire has been told a number of times. Stephen Griffiths and David Salmon were among those who made us aware that there were in fact two significant phases in which the Religious Society of Friends, as they came formally to be known, featured in the county’s history.i We were reminded both of their exceedingly difficult times here in the seventeenth century and also of their more rewarding and successful settlement later in the town of Milford Haven, as whalers and business folk. Remarkably, what we find is Pembrokeshire Quaker families moving to America in the sixteen hundreds and American Quakers moving into Pembrokeshire a century or so later. This article will focus on what can be discovered about a small group of Friends living in communities around the town of Narberth some three hundred and fifty years ago. The intention is to consider what drove them to leave Pembrokeshire and to investigate how they prospered in their new home in the New World. Followers of the itinerant preacher George Fox, under whose influence the religious group known as Quakers came into being, arrived in Pembrokeshire in the 1650s and Fox himself visited Tenby in1657 where he held meetings and was welcomed by the mayor and his wife. Also about that time his friend John ap John, from Wrexham, went to the local ‘steeple house’ and was imprisoned for standing in the church with his hat on. Fox was later to have a rough time in Haverfordwest, ‘a wicked town and false’.ii These are some of the earliest records of the persecution of Quakers in Pembrokeshire for a number of offences, among them absence from church, standing in church, wearing a hat in church, non-payment of tithes, refusing to take the Oath of Allegiance. 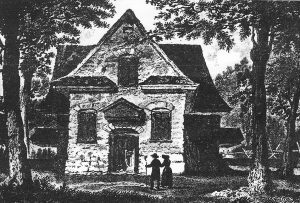 The Quakers did not meet for set religious services with clergy in consecrated buildings and in 1664 their gatherings came to be considered illegal under the Conventicle Act. It is important to remember how difficult people’s lives had already been in the early decades of the 17th century. Political and religious conflict, especially among the local gentry, would overwhelm society and the Civil War had considerable impact in and around Narberth and Redstone. In 1645 hundreds of fighting men, mounted and on foot, under Rowland Laugharne, together with a large body of seamen having sailed up the Eastern Cleddau, gathered at Canaston to march through local fields and communities to victory at the Battle of Colby Moor. With some 150 dead and 700 prisoners taken and many men fleeing, most likely in the direction of Narberth, things must have been very frightening. That same year nearby Picton Castle was attacked and renewal of hostilities in the Second Civil War would have seen distress and upheaval with the influx of troops gathering for Cromwell’s siege of Pembroke in 1648. To add to the turmoil in the county within a few years of the end of these hostilities plague broke out, causing deaths and the disruption to trade and the daily lives and movement of people. The names of certain of its members feature regularly in this account. One of these was Lewis David of Trewern, now a mansion and estate between Llanddewi Velfrey and Whitland. There appears to be little evidence of Lewis David’s roll in 17th century Pembrokeshire society and he has been variously described as a gentleman and a yeoman but what is evident is that he was a man with money and a very committed and influential member of the Redstone group of Friends. Map showing Redstone Meeting House, south of Redstone Cross on A40. (Pembrokeshire Record Office). Thomas Wilson in his journal described his travels in Wales in 1684 and how he received rough treatment from a constable and informer when he attempted to ‘Preach the Word of the Lord to the People’ in Redstone Meeting House.xi By then, however, several of the Friends were no longer in attendance. On the 6th of June 1682 in Pennsylvania, America, the Philadelphia Monthly Meeting was welcoming Lewis David, Henry Lewis and William Howell and accepting their certificate of introduction from the General Meeting at Redstone. In 1681 the influential Quaker, William Penn, had been granted by his friend, Charles II of England, control of a considerable area of land in North America in which it was understood a colony would be established. That same year a number of Quakers from different parts of Wales travelled to London to meet with Penn who intended to offer them an opportunity to purchase 30,000 acres of this territory, divided into blocks of 5,000 acres. 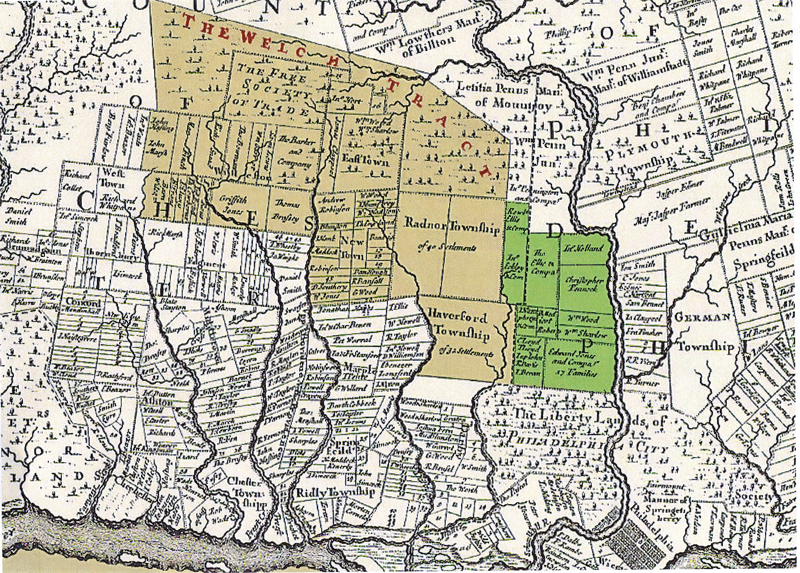 As it happened, seven purchasers came forward and they were granted land under what Penn considered the Dutch ‘patroon’ system, requiring them to look on him as their leader. 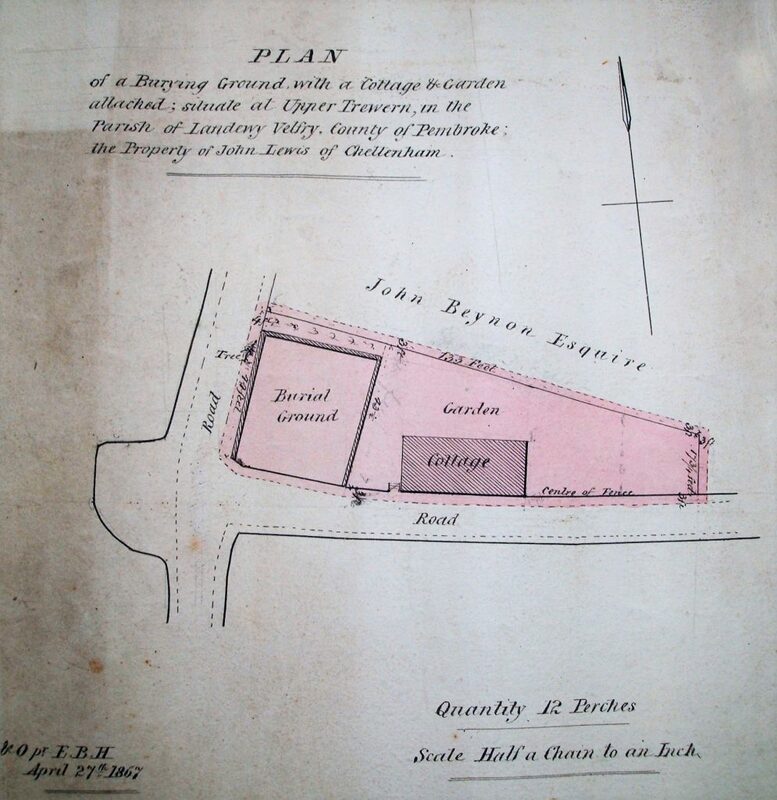 In time the lack of legal documentation covering this agreement would come to haunt the Welsh purchasers, Lewis David of Llanddewi Velfrey being one, committing himself to 3,000 acres for the sum of £60. The Trewern home of Lewis David is no longer in evidence. An early 19th century mansion now occupies the land in Llanddewi Velfrey, some 3km north-west of Whitland. Close by on the hill above the A40 is the Quaker burial ground which would appear to have been acquired some time in the later 18th century because records from the early 1700s show Friends were being interred at East Hook, Lambston, west of Haverfordwest. 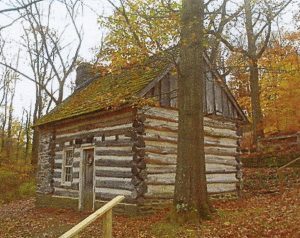 There are a number of accounts of the early journeys made from Wales to Pennsylvania by Quakers, many of them recorded by descendants of the early settlers. There appear to have been three main streams of emigrants, from the counties of Pembrokeshire, Radnorshire and Merionethshire. Browning tells us that in 1682-83 Welsh settlers crossed the seas to their new home in 23 ships.xvi They were heading across the Atlantic to the mouth of the Delaware River to settle in land north of Philadelphia and west of the Schuylkill River. Glenn records that during the next three decades Quaker Friends went to Pennsylvania from Redstone, Llanddewi Velfrey, Narberth, Haverfordwest, Tenby, Puncheston, Llandisilio, Castlebythe, Little Newcastle and Uzmaston. The Welsh Tract, by then some 40,000 acres, stretched northward along the south-west bank of the Schuylkill River and westward and south-westward over south-eastern Pennsylvania. In general it would cover within its borders eleven and one-half townships in Delaware, Chester and Montgomerie counties. We are told these caves would be rented to generations of new settlers after their occupants had taken timber from the forests to build more substantial homes. Some of the original settlers brought servants with them, many given pieces of land after serving their time. Burial records indicate that it was not uncommon for Quakers to acquire black slaves and this practice went on for decades in Pennsylvania. Although there were fruits and wild creatures in the forests to supply some of their food there was a severe shortage of cows and other domesticated animals. Cows for milking, when they could be obtained, were shared among the settlers. However, by the end of the 17th century there was a much more plentiful supply of foodstuffs which included beef, pork, mutton, cheese and butter. Horses and cows could be readily acquired. Browning concludes that in the early years settlers farmed for their own needs and not on a commercial scale. There were at that time no country stores and people were having to travel to Philadelphia for some necessities, often exchanging their produce for dry goods and groceries. xxvii They also expected quite naturally, coming from the farming communities of Wales, to set up their own water mills to deal with the harvest. One can imagine their dismay when on arrival they learned that William Penn had the monopoly on all kinds of milling. Private mills, whether for grist or timber, were forbidden. To have their grain ground the Welsh had to transport it many miles to the ‘Proprietors Mill’. Fortunately this problem appears to have been resolved for in 1700 we find Lewis David a part owner of a grist mill in Haverford. In fact grist mills, saw mills and fulling mills were to become plentiful in creeks along the boundaries of Haverford township well into the next century. Although the name of Lewis David of Trewern crops up on a number of occasions when religious and civil matters are mentioned in the early records of Quaker settlements in America, we are provided with very little personal information about the man and his family. We learn from the few surviving marriage records of the England and Wales Society of Friends that Susana, wife of Lewis David of Llanddewi Velfry was buried in Pembrokeshire on October 22, 1682. Lewis left some of his children in Wales when he travelled to Pennsylvania and it is later recorded that a Lewis David married Florence Jones at the Haverford Meeting in 1690. One could guess that he was something of a speculator. He appears to have bought and sold various sections of the Tract and as time went by he was to sell off much of the 750 acres he had originally retained for himself. 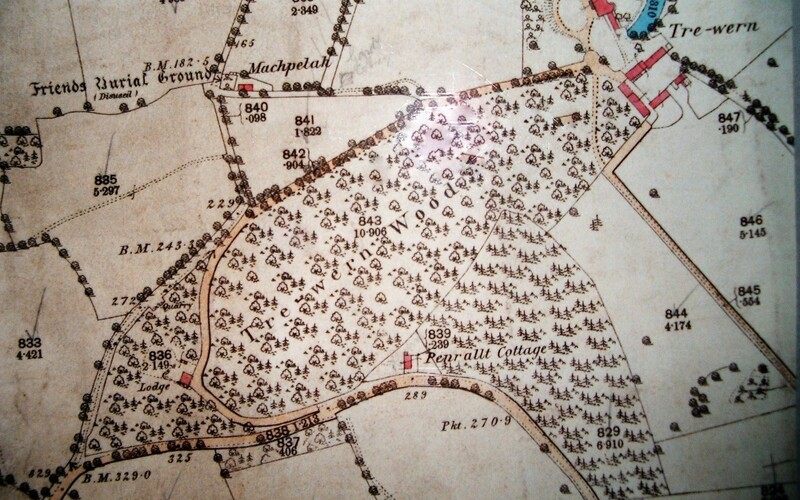 This included 250 acres to Maurice Scourfield of Narberth and 260 acres in Haverford township to Peregrine Musgrove, the Haverfordwest clothier, who in 1674 had married his daughter Alice back in Redstone. Evidently he involved himself rigorously in the fight for the survival of the Welsh Tract. Lewis David died and was buried at the Merion Meeting January 2, 1708. Henry Lewis, from near Narberth, a carpenter by trade, and his wife Margaret had a plantation of 250 acres in Haverford and he was to name his new home ‘Maencoch’ (Redstone). He was described as a benevolent man who having originally joined the Philadelphia Friends committed himself ‘to visit the poor and sick, and administer what they should judge convenient, at the expense of the Meeting.’ He held the office of ‘peacemaker’, and was foreman of the first Grand Jury for the county of Philadelphia.xxxii A founder member of the community, Henry did not have many years in Pennsylvania. He died in 1705. The Welsh Tract would eventually cover what would become eleven and a half townships in what are now Delaware, Chester and Montgomery Counties, Merion and Radnor being named after the shires of the old country and Haverford after the town of Haverfordwest in Pembrokeshire. 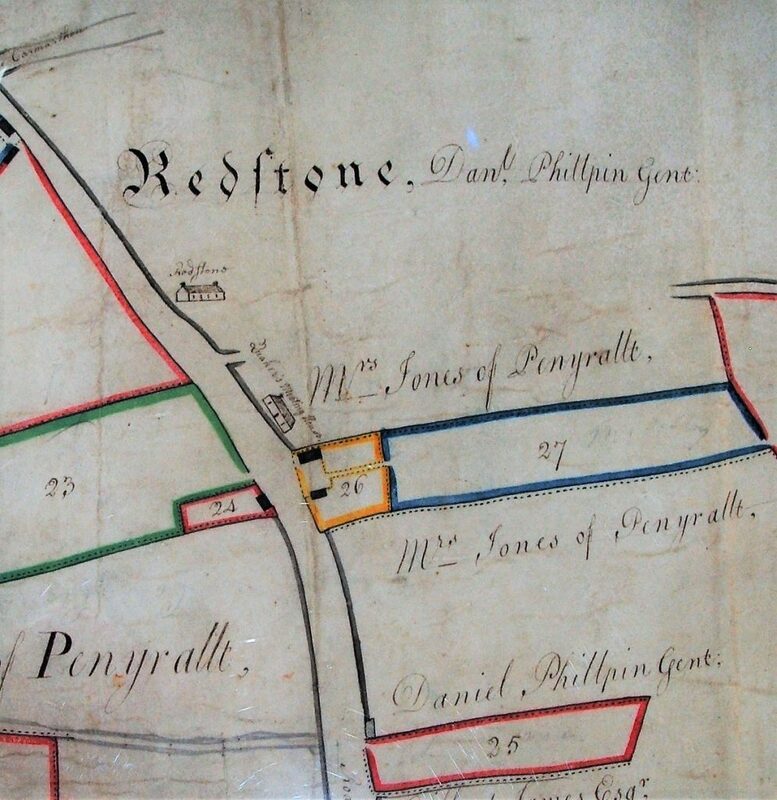 William Penn had determined when he sold this land to the Welsh that it would be considered a ‘Barony’ or State in what he retained as his province, “…within which all causes, quarrels, crimes and disputes might be tried and wholly determined by officers, magistrates, and juries of our language”.xxxiii In fact he sold this territory without giving information about locations, conditions or restrictions under which he made the conveyances. Added to this was the problem that the 62½ square miles were not surveyed for a further six years. It appears that this was to cause some confusion for people buying land subsequently, often direct from Penn, who found themselves involved in litigation or resurveys. Amongst these were John Burge, a clothier from Haverfordwest, and William Jenkins, an emasculator from Tenby. The Commissioners were evidently on the side of William Penn. Complex legal arguments went on for many months but Penn, now in financial difficulties, was determined to open up parts of the Tract to purchasers of other nationalities and religions and also to some of his pressing creditors. The unoccupied land was put on the market and this signalled the end of the Welsh Tract. We are used to places in the ‘New World’ being named after the ‘Old Country’. 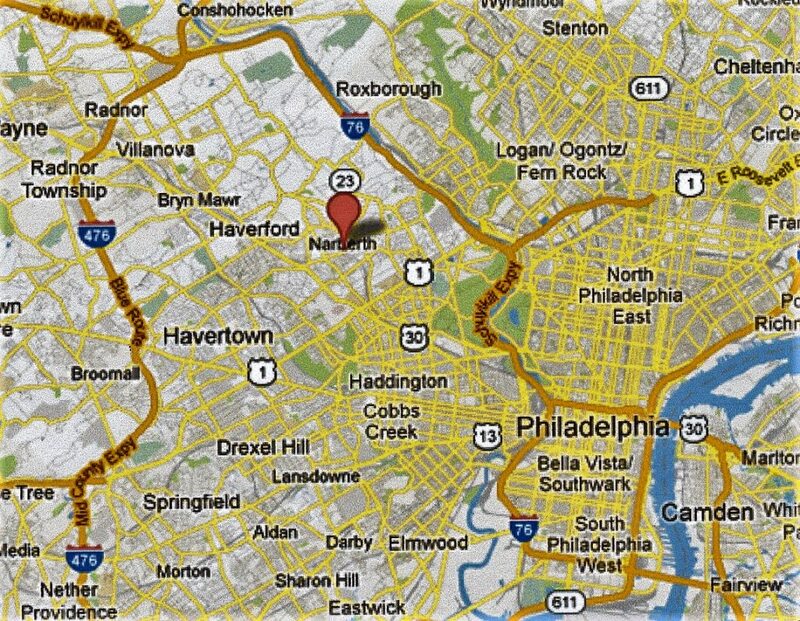 Haverford, Merion and Radnor do not surprise us. 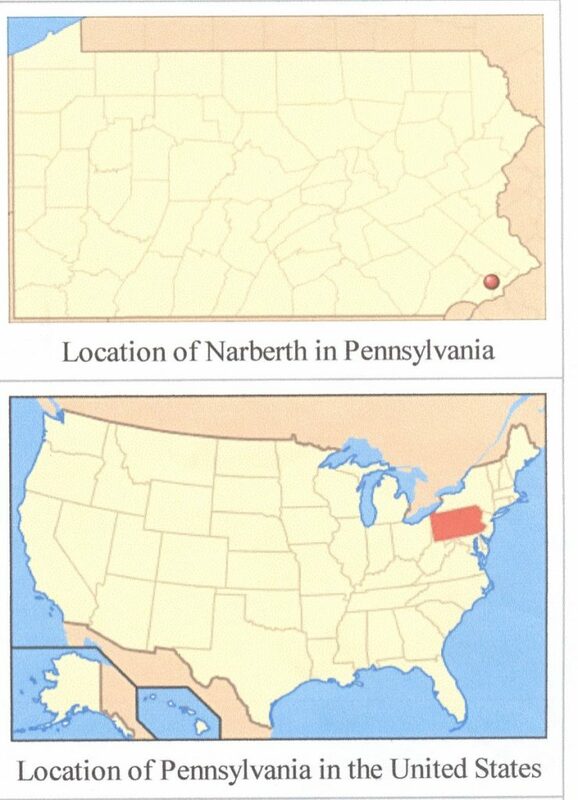 But what do we know of Narberth, a thriving town of about 5,000 people in Montgomery County, Pennsylvania? 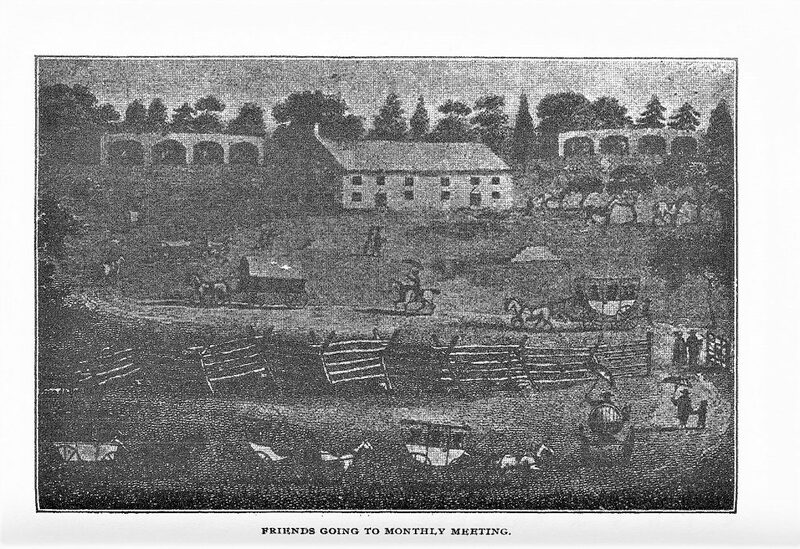 We are told that it is surrounded by the Township of Merion and is mostly residential ‘with leafy, picturesque suburbs with quaint Welsh names’.xxxvi Settled on a parcel of land originally deeded to Edward Rees who arrived in America in 1682 it was a Quaker friendly town originally called Elm, founded in 1881 by Edward Price. Not until 1893 did it change its name to Narberth. So, some two hundred years after the original settlement of the Welsh Tract was Redstone still in the minds of our Pennsylvania Friends? i David, Salmon, The Quakers of Pembrokeshire, in West Wales Historical Records Vol IX. Stephen, Griffiths, A History of Quakers in Pembrokeshire. (Gomer, 1995). ii George Fox, Journal, 1694. ( Eveyrman’s Library Edition, 1924). Honourable Society of Cymmrodorion, (Sessions 1946-1947. London: 1948). 208.
travels of that ancient servant of the Lord Richard Davies. London: J.Sowle 1705.
a Good Conscience. (2 vols, London, 1753). 747-752. History Society of West Wales, (Volume XII (Spurrel, 1927). the Ministry of that Eminent and Faithful Servant of Jesus Christ. ( London, 1730). History Society of West Wales, (Volume XII, (Spurrel, 1927).7.
xv T.M. Rees, History of Quakers in Wales. (Carmarthen: Spurrel, 1925). 119. Meeting of The Society of Friends, 1990) 40.
xxi P.W.Streets, Lewis Walker of Chester Valley and his descendents. (Punon Knaccuk, 1896).